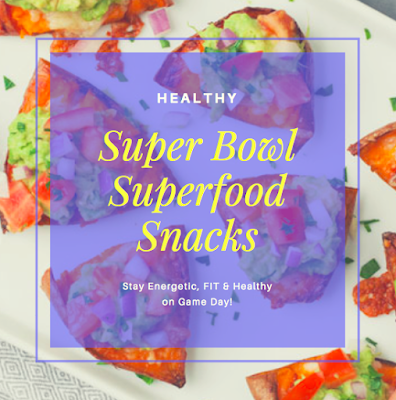 When watching the Super Bowl this Sunday with your friends and family, snacking is just a huge part of the fun, right? It just comes with the territory... But for those of us who are also watching our waistline, we also want options that are healthy while still being delicious!! SO, won't it be nice to be able to bring something guilt-free to the table for everyone to enjoy!? Add onion, garlic and cilantro and saute about 2 minutes, add ground turkey, salt, garlic powder, cumin and cook meat for 4 to 5 minutes until meat is completely cooked through. Add 1/4 cup of tomato sauce and chicken broth, mix well and simmer on medium for about 5 minutes, remove from heat. 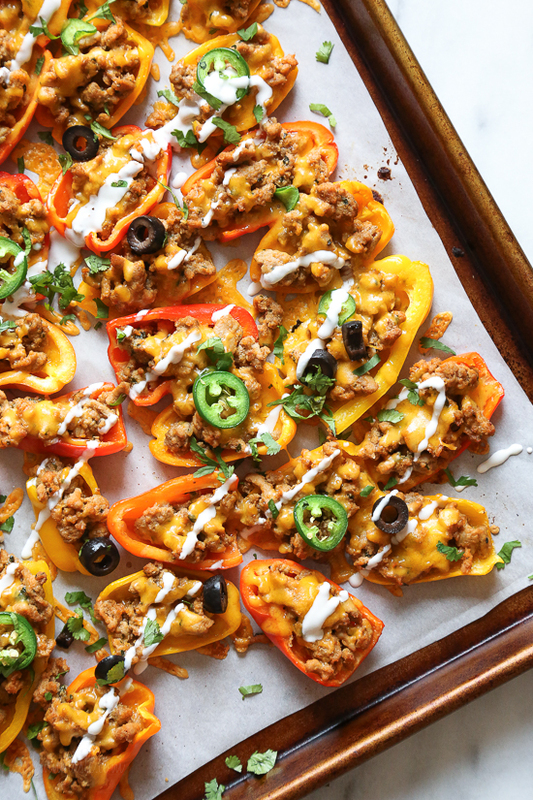 Meanwhile, arrange mini peppers in a single layer, cut-side up close together. Fill each with cooked ground turkey mixture, then top with shredded cheese and jalapeno slices, if using. Remove from oven and top with black olives, sour cream and cilantro. Serve immediately. Slice the cucumbers lengthwise on a mandoline at about a 2mm setting. If you don’t have a mandoline, you can always use a vegetable peeler. Place the cucumber slices on parchment paper and pat dry with a paper towel. Spread about 1 teaspoon of pesto on each cucumber, then evenly distribute cheese, turkey, bell pepper and spinach on each. Sprinkle with a little salt and black pepper. Roll up and place seam down. If you want an even nicer presentation, you can stick a toothpick in the middle for easy appetizers! 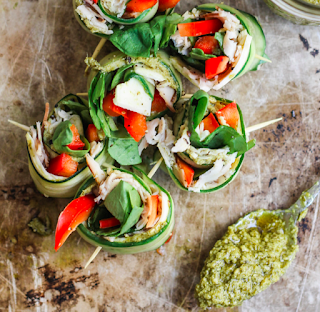 Serve with extra pesto or sauce of choice. Makes about 18 rolls. serve with bean, flax or chia chips for an extra boost of nutrition and taste! Eat them because: They offer big servings of fiber and protein, but make for a creamier and smoother dip than chickpeas. 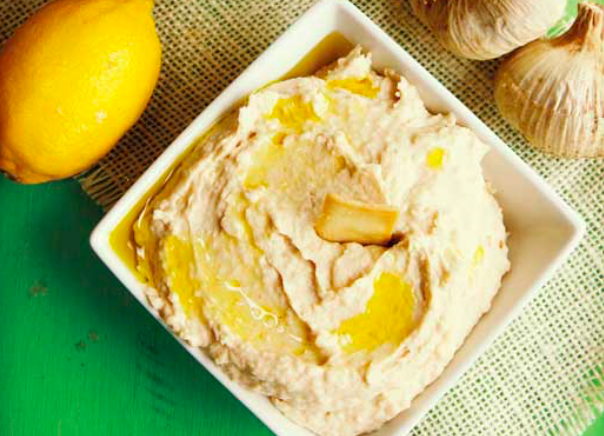 In a food processor, mix together the beans, lemon juice, tahini, garlic, salt, and hot sauce. Process until the beans are smooth, stopping to scrape the sides if necessary. With the processor running on low speed, stream in the olive oil through the chute and process until just combined. If you're a huge garlic fan, feel free to toss in a few more cloves for an extra kick (and maybe keep the breath mints nearby). Mushrooms are a humble yet potent cancer fighting fungi. White button mushrooms a supermarket staple are available all-year round and have been proven by research at the Beckman Research Institute of the City of Hope, Duarte, California, to contain beneficial quantities of conjugated linoleic acid (CLA) which induces apoptosis (cancer cell self-destruction) on prostate cancer and boost immunity. 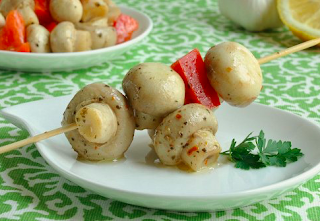 This fresh marinated mushroom appetizer is a savory umami filled bite. In a large glass, ceramic, or non-reactive bowl whisk oil, vinegar, dried herbs, salt, and red pepper flakes together. Cut mushrooms in half, add mushrooms, onion, garlic, and parsley to bowl with marinade. Stir well to combine. Satisfy your sweet tooth without the guilt! Place the oats, cashews, shake powder, dates, cocoa powder, and salt in a food processor, and blend until everything is a smooth, floury consistency. 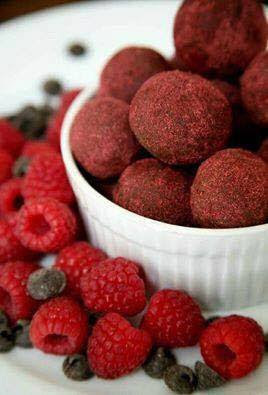 Pulse the freeze-dried raspberries in a Nutribullet or food processor. Store in the fridge in a sealed container for up to a week. 1- Scoop yolks out of eggs halves, mash and mix with greek yogurt, hot sauce, chicken, carrot, celery, onion and blue cheese. 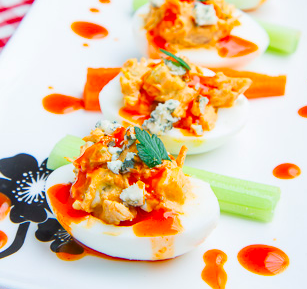 2- Place a tablespoon of mixture back into egg halves and serve garnished with extra blue cheese, hot sauce and parsley. This is Packed with vitamins, minerals, superfoods, antioxidants, digestive enzymes, prebiotics, probiotics and immunity boosters! 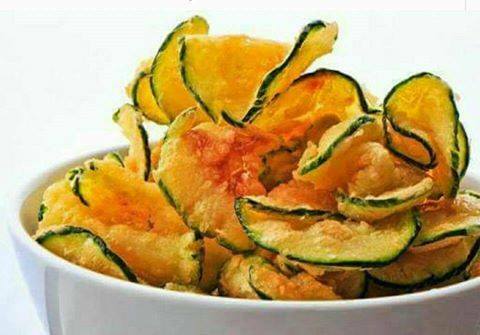 Serve with sliced fruit and enjoy! Cut a zucchini into thin slices and toss in 1 Tbsp olive oil, sea salt, and pepper. Sprinkle with paprika and bake at 450°F for 25 to 30 minutes. Tip: Use paprika not only to flavor this healthy snack, but also to boost your metabolism, reduce your appetite, and lower your blood pressure. cook quinoa in 4 cups water, according to package instructions. 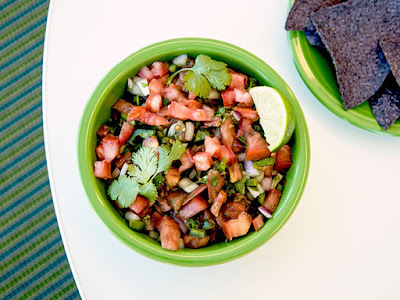 after cooking, set aside, add corn, onions, pepper, black beans, cheese and cilantro. pour over quinoa mix, stir gently to coat. Serve at room temperature and enjoy! 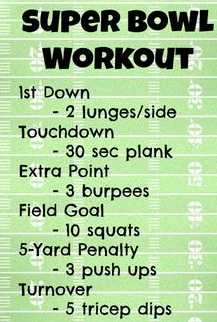 1- Workout in the morning to rev up your metabolism for the day- even a 10-15 min tabata or hiit routine can do the trick to get your heart pumping and energized for the day! Here's some great ideas for workouts. 2- Drink lots of water- bring a water bottle with you if you're going to a super bowl party! 3- Replace your first 2 meals with a Protein shake- a great way to help you stay on track on Super Bowl Sunday is to have a shake for breakfast and lunch so you have more freedom to enjoy your eating and time during the game. 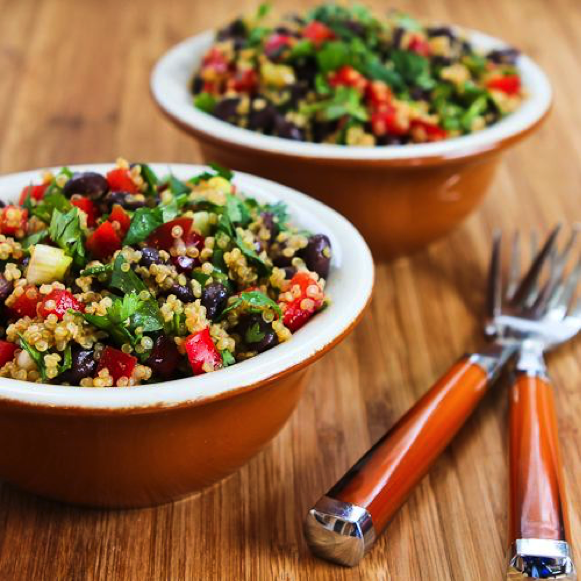 You'll get the protein you need to burn fat and build muscle and also feel fuller so you're less tempted to eat an entire bowl of chips mindlessly during the game! ;) Here's some awesome protein shake recipes to try out! 4- Have a shake just before you head out- another option is just before you head to your Super Bowl party, have your protein shake then so you're satisfied and less likely to snack and derail your efforts. 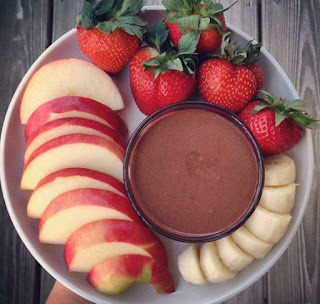 5- Bring and healthy snack or side dish to contribute- this will ensure you know at least one of the options is one you can enjoy while getting the nutrition your body needs to feel amazing. 6- Use commercial breaks to fit in some extra fitness! Squats, crunches, tricep dips and leg lifts are all simple moves you can easily fit in during commercial breaks. Bars, Balls and Bites- Protein Ball recipes that make perfect healthy snacks! Health Hacks: 10 Wellness hacks and tips you need in your life!